Diversity matters because it’s responsible for every innovation humanity has ever made, and will be responsible for every innovation of the future. “Guns, Germs and Steel” by Jared Diamond is one of my all-time favorite books. If you love to study history, you must read this book! The central question is this: why did the technology of Eurasian landmass and Northern Africa develop so much more quickly than the rest of the world, to the degree that those cultures were able to dominate all the other cultures of the world, like the Americas, Sub-Saharan Africa, and Oceania? The answer to such a complicated question is obviously also complicated, but the answer is definitely NOT “because the peoples of Europe and Asia are naturally smarter, and work harder.” It’s actually because they were just very lucky, geographically speaking, to have started out where they did. It’s because of the layout of the landmasses. Eurasia is one long horizontal continent with a wide band of similar climates from Portugal to Korea. Agriculture – the engine of civilization – could, and did, spread across that band like an information superhighway. The seasons are similar in China and Spain, and in most every town in between them. The seasons are not similar in Canada and Mexico, or in Colombia and Argentina, or in New Zealand and Hawaii, so the farming has to be very different, and the techniques can't be easily shared. Here’s how it worked in Ancient Eurasia: a farmer in ancient Turkey notices that, by strapping a plow to an auroch, he can plow his field twice as fast. A vagabond traveling from town to town sees the farmer doing this, and when the vagabond arrives in the next town to the east, he goes to the market and says, “Hey, you know those big cow things you have in a pen over there so you can eat them later? The people over in Abu Hurayra are using them to plow fields! I’ll show you how if you buy me a beer.” These little (and big) innovations in food production spread along the geographical band over the course of a few thousand years. Efficiency improvements led to extra food. Extra food meant not everyone had to farm, which created priests, poets, blacksmiths, soldiers, and sailors. That job specialization created every innovation there ever was. In short: civilization as we know it. Those innovations continued to spread for thousands of years, from the ancient Han Empire in China to the Roman Empire along that same geographic band, now dubbed “The Silk Road” by the Romans – because that’s where the silk came from. People living on landmasses that were “cut off” from other cultures by mountain ranges, or different climates, or oceans – didn’t develop as quickly because the innovation couldn’t spread as far, and there weren’t as many different cultures with different ideas contributing to the conversation. There's a myth about invention and innovation that we generally believe, that it occurs as a result of one brilliant person creating something wholly unique out of absolutely nothing. The truth is that every invention ever is a culmination of the work of many different people that came before - as Newton said, he had the advantage of the giants' shoulders to stand on. That’s why diversity matters: not so much for the campfire “Kumbaya” harmony, but because the interaction of different cultures moves humanity forward. Giving everyone a chance to speak, and listening to what they say, especially when their perspective is different from yours: that can change the world. Look around you – all that we have is a result of that conversation. Diamond, Jared. 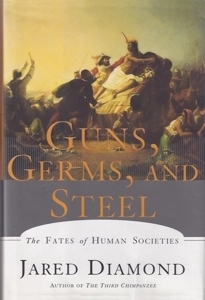 Guns, Germs, and Steel: The Fates of Human Societies. New York:Norton, 1999. Older Post"I don't care about politics. . ."